As with the pre-prep and infant provision, Highclare has two junior settings, one at Highclare Preparatory School: Woodfield, and one at Highclare Preparatory School: St Paul’s, both located in Sutton Coldfield. Each step along your child’s school journey is treated with care to ensure their transition is smooth and each pupil feels confident and excited to learn. Both Highclare Preparatory School: Woodfield and Highclare Preparatory School: St Paul’s offer an excellent pastoral system and a caring ethos to welcome each child into the warmth of the schools’ family atmosphere, and to build on the foundation of educational, emotional and spiritual development founded in the pre-prep and infants setting. This is achieved through clear moral values fostered by assemblies, circle time, PSHCE and a house system to generate team spirit. The pupils benefit from leadership opportunities and are given positions of responsibility, including Head Boy and Head Girl, prefects, form captains, school council representatives, sports captains and house captains. Highclare offers a rich and vibrant educational experience to equip happy, confident children with a lifelong love of learning and expressing themselves. We firmly believe in fulfilling potential in everyone, and respect each and every pupil’s unique qualities. 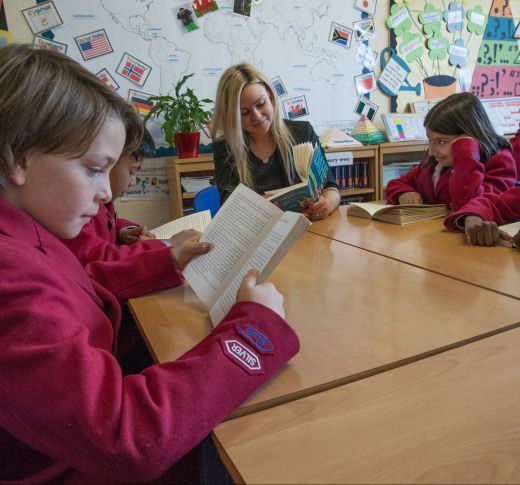 Our superb grades reflect the outstanding teaching delivered at Highclare, with our small class sizes allowing for personalised learning and individual attention, including differentiated work to cater for the needs of each child. Pupils are encouraged to interact and develop a wide range of social and communication skills through attending assemblies, school trips, circle time activities, performances and more. The progress of each and every child is monitored carefully, with monitoring and assessment key to informing future learning opportunities for each child.